Western Australia does things a little differently to the rest of the country when it comes to energy. There is a mountain of regulation regarding which retailers can supply gas and electricity, and where it can be serviced. There’s a lot to take in and it can all get pretty confusing. That’s why Canstar Blue has made this guide to help our West Australian readers better understand if they have energy options, and if so, what they are. Before we get started, there is an important distinction to draw between customers who live within the South West Interconnected System (SWIS) and those outside this area. What is the South West Interconnected System? The SWIS is an electricity distribution network operated by Western Power. It covers the most populated area of Western Australia, from the south-west coast to as far north as Kalbarri (pictured). Only customers on this network may have the option to select their electricity retailer. There are four other energy networks in Western Australia: South Region, North Region, Gascyone/Mid-West and the North West Interconnected System. Most customers on these networks will be restricted in their choice of energy supplier. Can I choose my electricity retailer? Western Australian energy customers fall into two categories: contestable and non-contestable. Contestable customers can choose their retailer, while non-contestable customers are supplied by Synergy. 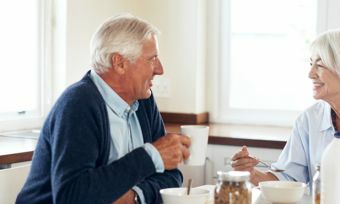 Customers are non-contestable if they are within the South West Interconnected System and use less than 50 megawatt hours (mWh) of electricity each year. As the average household only consumes around 6 mWh per year, virtually all residential electricity customers and the majority of small business customers in the SWIS area are non-contestable. Horizon Power is the only retailer that supplies electricity (both business & residential) in most regional areas outside of the SWIS area. Electricity prices are government regulated for households and small businesses, as well as some large businesses. This means a government body sets the price for electricity and not the retailers. The government has upheld a uniform tariff policy for many years, meaning electricity usage and supply charges are the same across the state, regardless of location. While that’s good for regional customers where electricity is more expensive to supply, it pushes up the price of electricity for South-West customers. The majority of non-contestable customers are connected by Synergy. The retailer offers three residential products: Home Plan, Smart Home Plan and Home Business Plan. The Home Plan has a flat rate tariff, the Smart Home Plan has a time-of-use tariff, and the Home Business Plan has a block rate tariff. Prices sourced from Synergy website, December 2018. Keep in mind that you’ll need a smart meter to sign up to Synergy’s Smart Home Plan and Home Business Plan. Businesses customers will need to contact Synergy directly to receive a quoted price. You can learn more about Synegry electricity tariffs and find the right option for your household here. Prices sourced from Horizon Power website, December 2018. Attentive readers will notice that Synergy and Horizon Power rates are very similar. Again, that’s because Western Australian electricity prices are set by the government. The only difference between the two energy companies is that residential customers outside the SWIS network won’t have access to a time-of-use tariff (Smart Home Plan). Horizon Power offers seven business products with various rates and tariffs depending on the size and type of business. As an example, a charitable organisation is charged lower rates than a small business, while a small business is charged lower rates than a large business. You can see Horizon Power’s business products on its website. The solar feed-in tariffs offered by Synergy and Horizon Power in WA are generally much lower than the maximum rates offered in other states and territories. Can I choose my gas retailer? The Western Australian retail gas market is fully contestable, meaning natural gas retailers are free to compete in an open gas market. 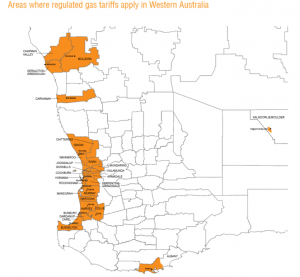 The price of gas is, however, regulated in some of the most populated areas of Western Australia, including Geraldton and surrounding areas, Carnamah, Albany, and the Perth metropolitan area extending north to Gingin and south to Busselton. These are indicated by the orange areas on the map pictured to the right. Gas prices are not regulated outside these areas, meaning gas retailers are free to set their own usage rate. In addition to regulated gas rates, retailers may charge additional fees which aren’t regulated by the government. These gas companies are all licensed to retail gas in the Perth metropolitan area. Alinta Energy also services the Kalgoorlie-Boulder and Albany areas. Perth Energy is also now authorised to sell gas in the Perth area, but is yet to launch a residential service. The state government has a residential gas price cap for small customers in WA. While all gas companies set their prices near this price cap, each retailer provides value offers through discounts to customers who pay their bill on time or pay using direct debit. Customers in Albany and Kalgoorlie-Boulder are charged for their gas on a flat rate tariff, meaning the same gas usage rate is charged regardless of the time or amount used. For now, if you’re a gas customer, then you need to take advantage of the state’s new-found competition. To find the best deal on WA gas, get started with Canstar Blue’s report on Western Australian gas suppliers via the link below.